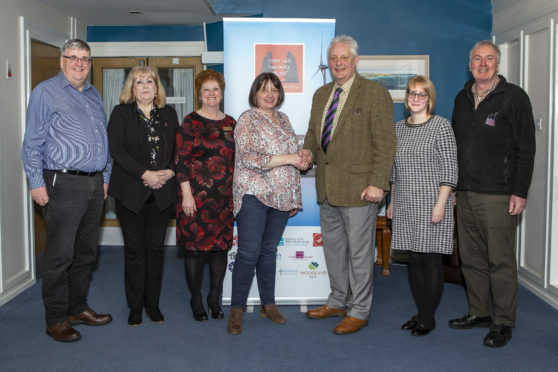 The Bethesda Hospice, which provides end-of-life care and support to island families, has received a welcome boost after receiving another £30,000 from community wind farm charity Point and Sandwick Trust (PST). The donation is the latest from PST who own and operate the Beinn Ghrideag wind farm, donating all profits generated to communities across the Western Isles. The PST has committed to donating £55,000 to the Bethesda Hospice each year over the lifetime of its turbines, with the pledge set to last 25 years. Carol Somerville, Bethesda general manager, said the commitment from PST to donate £55,000 each year is “a massive boost” as it offers “the stability and sustainability that we need”. The financial agreement between the two organisations was pledged six years before the wind farm became a reality after a memorandum was signed, signifying the PST’s commitment to aid in funding the vital care asset. PST board member Rhoda Mackenzie stressed the importance of the Bethesda Hospice and urged other groups to follow suit in providing funds. She said: “It’s essential that other groups consider the unit foremost when they are deciding where to put the money and that they make a long-term commitment, like we have, so Bethesda can use that as part of their financial planning.